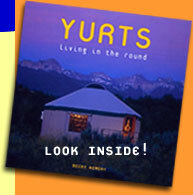 From the very beginning, yurts were designed to be portable. The nomadic tribes of the Asian Steppes were frequently on the move and they needed the ability to break down a a yurt and move. Unlike many of the architectural yurts, camping yurts can be disassembled quickly and are relatively light. They normally sit directly on the ground rather than on a platform. Today’s portable yurts are not designed to be permanent structures. There are several companies that specialize in portable camping yurts. The costs are generally significantly less than the more permanent architectural yurts. 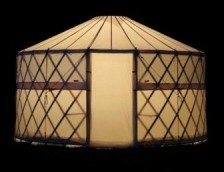 Since there is little thought to building codes with portable yurts, that savings is passed on to the buyer. Being that portability is what is desired, the yurts are generally less ornate than the more permanent versions, though there are a few models that are quite exquisite (and costly). If you are looking to purchase a camping yurt, you should keep on eye on a couple of selling points: durability and weight. Chances are that you will be putting this yurt up and down so the parts need to be durable. The fact that you will be moving it from place to place speaks to why you want it to be as light as possible. Weight is reason why these yurts usually sit directly on the ground and not on a platform or foundation.